Srimanmaharaja Samskrita Graduation and Post Graduation Centre is located in the city of Mysore, famed as the cultural capital of Karnataka. 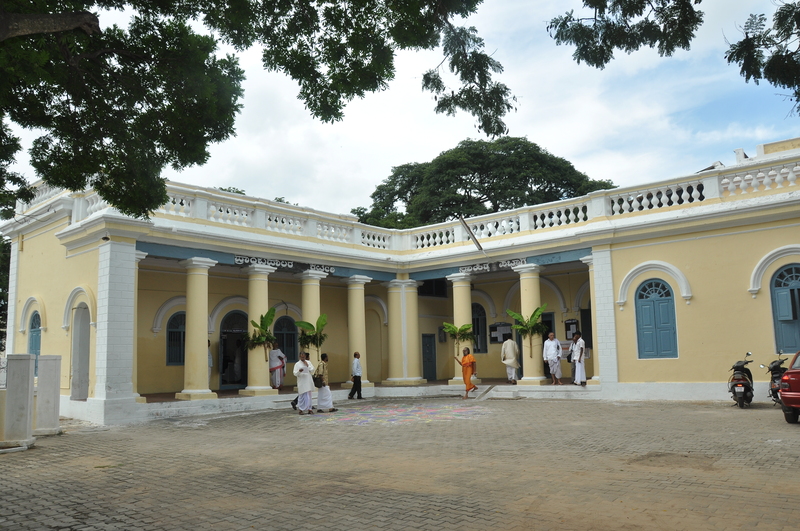 It was the first Samskrit college to be established in Karnataka, (1868) as a result of far-sightedness of His Highness Mummadi Krishnaraja Wodeyar, the then ruler of Mysore. After his death, Diwan. Sri Rangacharlu, and His Highness Krishnaraja Wodeyar IV encouraged the growth and development of the pathashala. Initially, two teachers were appointed for the study of tarka and vyakarana shastras. Later, study of Rigveda and Yajurveda was added. Today, the college boasts of 14 departments, and has over 500 students. During the initial years, examinations for students were being conducted during the Navaratri celebrations, by a scholarly committee in the presence of the Maharaja of Mysore himself. Successful students were felicitated by the Maharaja. After 1917, a Samskrit examination board was established for conducting the examinations. In 1950, administration of the college was taken over by the Government of Karnataka. Centenary celebrations were held in the college in 1976. Inauguration of centenary celebrations was by Sri. B D Jatti, the then Vice-president of India. Today, Sriman Maharaja Samskrita Graduation and Post Graduation Centre is providing education in Vedas, Shaastras and Agamas, without any discrimination based on caste or creed. Presently, there are about 515 students in the college. There are 31 faculty members (including Agama department), and 9 administrative staff. It provides free hostel facility to over 250 students. The college produces consistently good results in the examinations. Students also excel in co-curricular activities and competitions. They have brought laurels to the college from the state and National level Samskrita vakpratiyogita (speech competitions), as well as in other competitions in Mysore, such as the inter-hostel, inter-university debates, and music competitions, etc. Shaastras – Alankaara, Vyaakarana, Naveenanyaaya, Poorva Meemaamsaa, Vishishtaadvaita vedaanta, Shaktivishishtaadvaita vedaanta, Dharmashaastra. In 1928, the Maharaja of Mysore donated about 1670 manuscripts and 2100 printed books from his own Saraswati Bhandaara to the college. He established the Saraswati Bhandaara in the college itself, complete with an idol of the Goddess of learning. Currently, this contains about 5000 books. In addition, the college library has a huge collection of 11800 valuable texts. The college contains a good Hostel. There are about 44 rooms in the hostel, and it provides free food and accomodation to about 250 students. In addition, an organisation called Vedashaastra Poshini Sabha is providing meals to about 50 students of the college.